HGM96XX series genset controllers are used for genset automation and monitor control system of single unit to achieve automatic start/stop, data measure, alarm protection and “three remote” (remote control, remote measuring and remote communication). The controller adopts large liquid crystal display (LCD) and selectable Chinese, English or other languages interface with easy and reliable operation. HGM96XX controller adopts 32 bits micro-processor technology with precision parameters measuring, fixed value adjustment, time setting and threshold adjusting and etc. The majority of parameters can be set using front panel and all the parameters can be set using PC (via USB port) and can be adjusted and monitored with the help of RS485 and ETHERNET ports. 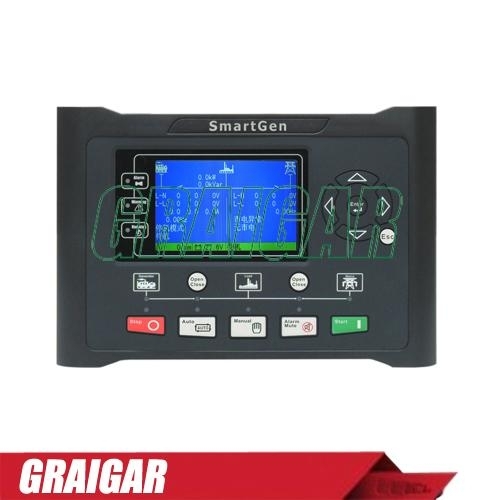 Controllers are fitted with Micro SD for real-time operation data recording for convenient browsing and timely fault detection.It can be widely used in a number of automatic genset control system with compact structure, simple connections and high reliability. HGM9620, has all functions of HGM9610 as well as mains electric quantity monitoring and mains/generator automatic transfer control function (AMF), particularly well suited for single automation systems that include mains and generator. ♦With ARM-based 32-bit SCM, highly integrated hardware, new reliability level. ♦Equipped with CANBUS port and can communicate with J1939 genset. Not only can you monitoring frequently-used data (such as water temperature, oil pressure, speed, fuel consumption and so on) of ECU machine, but also control starting up, shutdown , raising speed and speed droop via CANBUS port. ♦Collects and shows 3-phase voltage, current, power parameter and frequency of generator or mains. ♦Parameter setting: parameters can be modified and stored in internal EEPROM memory and cannot be lost even in case of power outage; most of them can be adjusted using front panel of the controller and all of them can be modified using PC via USB, RS485 or ETHERNET ports. ♦Modular design, anti-flaming ABS plastic enclosure, pluggable connection terminals and embedded installation way; compact structure with easy mounting.